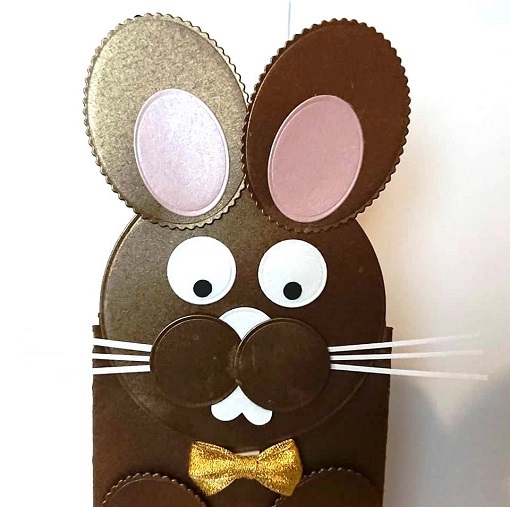 Great way to present chocolate, Chicks or any Easter gift thanks to Jenny Redfern. Cut Bronze card 29.5cm by 21cm and score this at 4,14,18 and 28cm the extra bit is the flap to stick it together. 1 x Nose from White Ice Card, size 1, circle die. Die Cut a hole in the front panel for the window, Using the Ultra Clear Tape, stick a rectangle of Extra Thick Acetate behind. Everything else is layered up with 2mm foam pads. 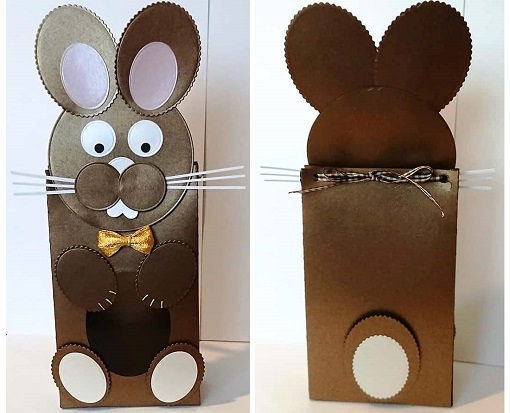 Fold the edges of the card in to create your basic box and stick together with Ultra Clear Tape. Hole punch the card at the top to be able to thread the ribbon before attaching the head. Cut whiskers from the White Ice Card and stick to the head using the 2 in 1 Glue Pen along with the eyes, nose, cheeks and teeth to the head. Using the Foam Pads later up and attach the ears to the head and then the head to the body. Layer up the feed and tail with the Foam Pads and again using the Foam Pads attach this to the body. Thank you Jenny for this wonderful box. Please visit Jennys Blog for more of her work.